A few days ago, Floyd Mayweather, Jr. unveiled his top five all-time boxers on ESPN Deportes' Nación ESPN. Unsurprisingly, he had himself at number one, but his succeeding picks weren't as predictable as his narcissistic tendencies. Although it was a subjective list, his selection stirred up controversy, particularly because he placed the great Muhammad Ali at the bottom of the list. The pugilists he fancied were all great, but his reasoning for putting them up there was questionable. Alright, alright. Floyd is entitled to his own opinion, we can't deny him of that. But if he was an ardent student of his sport’s history, his Top 5 should’ve looked more like the lineup below. If you think Floyd is a master of the sweet science, then you could consider Pep a grandmaster. Rumor has it that Willie once won a round without even throwing a single punch, impressing the judges solely by making his opponent look silly, missing blows. Matching the former featherweight king's extremely high technical proficiency is his toughness. In 1947, he got severely injured in a plane crash; in the same year, he returned to action and came up with a string of wins, setting him up for another world title win in 1949. The Brown Bomber ruled over the sport like no other. He was the heavyweight champ for 11 years, from 1937 to 1948, wherein he defended the belt for a record 25 times. Louis was able to accomplish the god-like feat due to his murderous punching power, most evident in his right cross. Floyd likes to brag that he’s been a world champion for 17 years. That's undoubtedly impressive, but it pales in comparison to Louis' dominance, considering the latter's compilation of electrifying knockouts during his 11-year reign. In short, Brown Bomber fights = crowd-pleasing, Mayweather fights = snoozers. 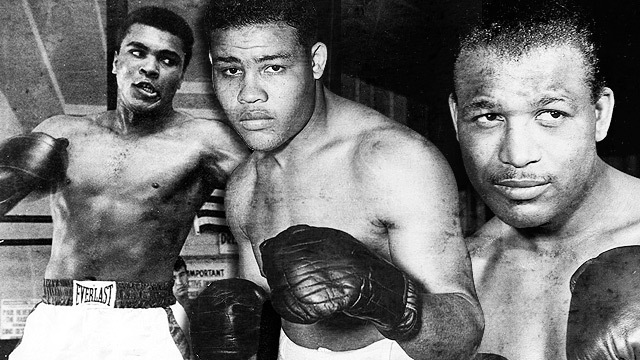 Prior to Ali's nearly four-year exile from boxing because of his refusal to join the army draft in 1967, "The Greatest" fought like he really was the greatest fighter ever. Watching him in his heyday was a thing of beauty. Ali floated like a butterfly and stung like a bee, just like how his famous quote goes. His ring movements were balletic. Ali wasn’t a big puncher, but his precision was more than enough to make up for his power deficiency. He didn’t have that one-punch knockout ability Joe Louis possessed, but Ali had the lethal combinations and accuracy to stop people. The man formerly known as Cassius Clay was an Olympic Gold medalist as a light heavyweight and is the only three-time lineal heavyweight champion in boxing. But what really separates Ali from his fellow legends and superstars is the fact that he never ducked anyone. Ali has fought the baddest, toughest, most vicious boxers in his era and triumphed over most of them—something Floyd never did. Look up the names Joe Frazier, George Foreman, Sonny Liston, Ken Norton, Earnie Shavers; those men were as scary as the thought of coming across Kimbo Slice in a dark alley. There are tons of multi-division boxing champions, but perhaps, the best of them all was Henry Jackson, Jr., better known as Henry Armstrong. Nicknamed Homicide Hank, Henry's killing spree spread in the 1930s, in which he became the only man in boxing history to hold three championships in different weight classes simultaneously. In 1938, he held crowns in the featherweight, welterweight and lightweight categories at the same damn time. Downright unbelievable. Without the presence of strength and conditioning coaches, and advance training methods during that time, how Armstrong was able to go up and down in weight just makes him a physical marvel. On his fighting style, think a well-focused Manny Pacquiao vs. Ricky Hatton. We have one kababayan who felt the wrath of Henry: Filipino boxing legend Ceferino Garcia fought Armstrong twice, losing the first one and settling for a draw in the rematch.